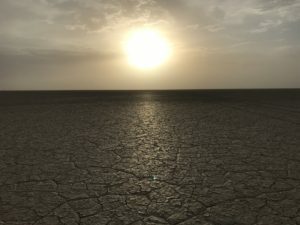 We had no definitive plans to visit the playa, the part of the desert that had been the bottom of a vast lake during the last ice age, and which is now an almost perfectly flat, cracked alkali mud flat. 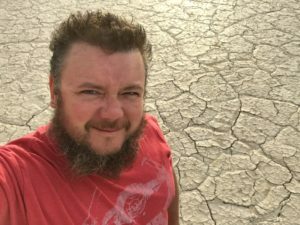 But the BLM bunkhouse in Fields was full, and given the choice of pitching a tent in the field behind the bunkhouse and driving a half hour up to the playa, a night on the floor of the desert sounded much better. 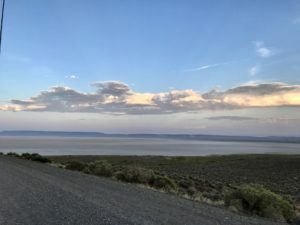 The asphalt switches to gravel after a few miles, and the bone-jarring ride of a government vehicle gets into your system after a day of driving on these unimproved roads. 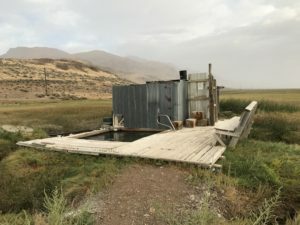 The kid taking money at Alvord Hot Springs arrived from Idaho a week before and was more interested in talking to his friends heading to Mann Lake than checking people in. He vaguely pointed out a couple of spots behind us the way we had come in and told us we could go down and camp directly on the playa. We opted for two tent spots near the hot springs for twenty dollars. The music from the pickup truck filled with fly rods and adventure gear faded away as they made their way up the road to Mann Lake. I didn’t have the heart to tell them it was only six-inches deep and all the fish were dead. They looked like they had come a long way for the adventure, and sometimes the news is better delivered by the object of your desire. The air was still and quiet as we set up tents and ate some pita chips and hummus. I drank a couple of beers and glanced back and forth from the mountain towering above us and the cracked, chalky earth stretching away from us for miles. As the sun set behind the big fault block, I waited for the stars to appear. The hot springs were tepid at best, until a guy with a cigarette dangling from his lips showed us how to readjust the pipes to pull in some hot water. As the pools filled up with hot mineral water from deep under the earth, the stars came out like they had been hiding from me my whole life. The Milky Way splattered across the sky like a painting. Or a hole into which it’s difficult to look for fear knowing no end. I’m always enamored of the Milky Way and the way it makes me feel so small looking out at the spiral arms of a galexy in which our tiny, blue planet resides. The danglin cigarette couldn’t be ignored. How the hell did he keep it lit? How does he talk without sounding like he has a cigarette in his mouth? He’s a walking Doonsbury comic. My colleague asks him what it is, and he replies that it’s a Marlborough. The water has its effect on me, and I’m drowsy and owe my wife a call. I stumble back to the tent and settle into bed with no rain fly on, because we’re in a desert that gets like six inches of rain a year. I talk until I mumble, until then I fall asleep. And it’s morning, and my tent is flapping in my face, the result of a tweny mile per hour wind blowing in the dark off the desert. Something that happens as a result of heat rising and cold falling and flat desert and fault block mountain. I watch the walls of the tent close in around me for a bit, and then I feel raindrops, and I decide to get up and put it all away. It’s raining in the desert. 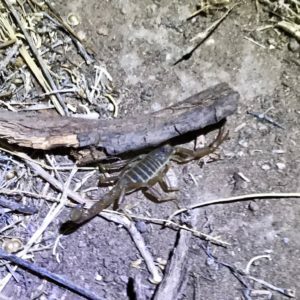 The scorpion slid out from under my shoe like I imagine a rat stealing away with something precious. This Northern Scorpion stole away with my sleepyness. The rest of the morning I was wary and on my guard. I slipped back into the hot springs as the rain continued to drop in big drops like packages in little parachutes coming down from the nine thousand foot peaks above us. 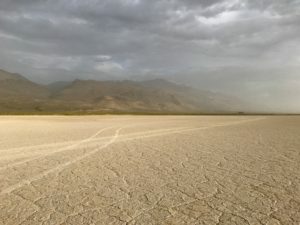 We drove out onto the playa, which, in spite of the rain, was dry and parched like a shattered window, the cracks spreading as far as the eye could see . 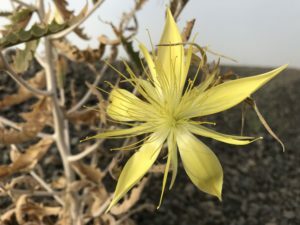 I stood on it and looked up at the big snowy mountain without snow to the north and at the bright sun diffused through some strange mist to the east. It felt like a different world. Like nothing I had ever seen or experienced on this earth before. Nothingingness or the next best thing in every direction. Just the sun, the sky and the dry, cracked alkali below my feet. To stand inside the canopy of an ancient coastal rainforest, beneath the elder Sitka Spruce and Red Cedar, is the kind of experience that can change your life. To stand under an even more ancient block of earth’s crust towering above you there on the bed of a lake far older than the oldest Sitka Spruce ever is to understand a smallness that not even staring up at the Milkey Way can produce. These old parts of the world, where the very crust of the earth, uncultivated and raw claws at the sky, are like fires frozen into stone.